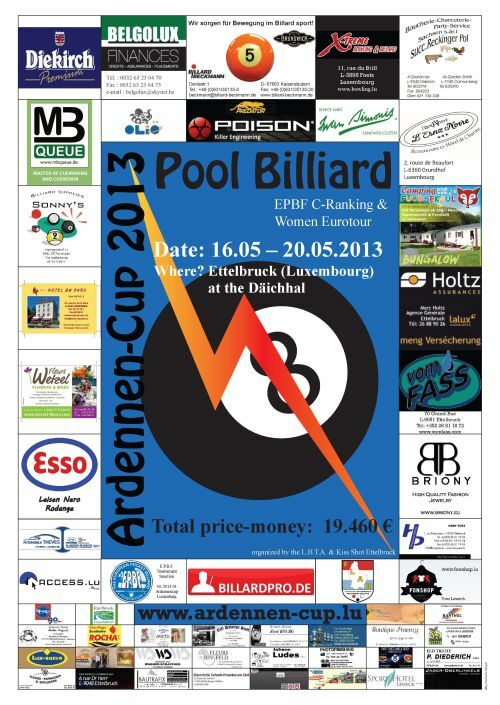 OK, new tournament, new chances:) I am now in Ettelbruck, Luxembourg, playing the Ardennen cup. Today I have played the mens event, tomorrow I will play the teams and sunday the most important: Eurotour for women! Today I have played the mens divison, and I got 4 matches in before I lost. Good practice and tomorrow it is the teams competition with Fredrik Førde and Jone Ree Skjelbred. Our name is Norway and you can find results HERE from 14:00 tomorrow. Sunday we are 71 players and you can find results both on eurotourwomenonline.eu and on the link above. So far I am seeded no 7 and will probably get a wo in the first round. Updates and pictures will come!